In July of 2012, researchers at the CERN laboratory made history when they announced the discovery of the Higgs Boson. Though its existence had been hypothesized for over half a century, confirming its existence was a major boon for scientists. In discovering this one particle, the researchers were also able to confirm the Standard Model of particle physics. Much the same is true of our current cosmological model. For decades, scientists been going by the theory that the Universe consists of about 70% dark energy, 25% dark matter and 5% “luminous matter” – i.e. the matter we can see. But even when all the visible matter is added up, there is a discrepancy where much of it is still considered “missing”. But thanks to the efforts of a team from the Commonwealth Scientific and Industrial Research Organization (CSIRO), scientists now know that we have it right. This began on April 18th, 2015, when the CSIRO’s Parkes Observatory in Australia detected a fast radio burst (FRB) coming from space. An international alert was immediately issued, and within a few hours, telescopes all around the world were looking for the signal. The CSIRO team began tracking it as well with the Australian Telescope Compact Array (ATCA) located at the Paul Wild Observatory (north of Parkes). Image showing the field of view of the Parkes radio telescope (left) and zoom-ins on the area where the signal came from (left). Credit: D. Kaplan (UWM), E. F. Keane (SKAO). With the help of the National Astronomical Observatory of Japan’s (NAOJ) Subaru telescope in Hawaii, they were able to pinpoint where the signal was coming from. As the CSIRO team described in a paper submitted to Nature, they identified the source, which was an elliptical galaxy located 6 billion light years from Earth. This was an historic accomplishment, since pinpointing the source of FRBs have never before been possible. Not only do the signals last mere milliseconds, but they are also subject to dispersion – i.e. a delay caused by how much material they pass through. And while FRBs have been detected in the past, the teams tracking them have only been able to obtain measurements of the dispersion, but never the signal’s redshift. Redshift occurs as a result of an object moving away at relativistic speeds (a portion of the speed of light). For decades, scientists have been using it to determine how fast other galaxies are moving away from our own, and hence the rate of expansion of the Universe. Relying on optical data obtained by the Subaru telescope, the CSIRO team was able to obtain both the dispersion and the redshift data from this signal. As stated in their paper, this information yielded a “direct measurement of the cosmic density of ionized baryons in the intergalactic medium”. Or, as Dr. Simon Johnston – of the CSIRO’s Astronomy and Space Science division and the co-author of the study – explains, the team was not only to locate the source of the signal, but also obtain measurements which confirmed the distribution of matter in the Universe. As already noted, FRB signals are quite rare, and only 16 have been detected in the past. Most of these were found by sifting through data months or years after the signal was detected, by which time it would be impossible for any follow-up observations. To address this, Dr. Keane and his team developed a system to detect FRBs and immediately alert other telescopes, so that the source could be pinpointed. It is known as the Square Kilometer Array (SKA), an international effort led by the SKA Organization to build the world’s largest radio telescope. Combining extreme sensitivity, resolution and a wide field of view, the SKA is expected to trace many FRBs to their host galaxies. In so doing, it is hoped the array will provide more measurements confirming the distribution of matter in the Universe, as well as more information on dark energy. 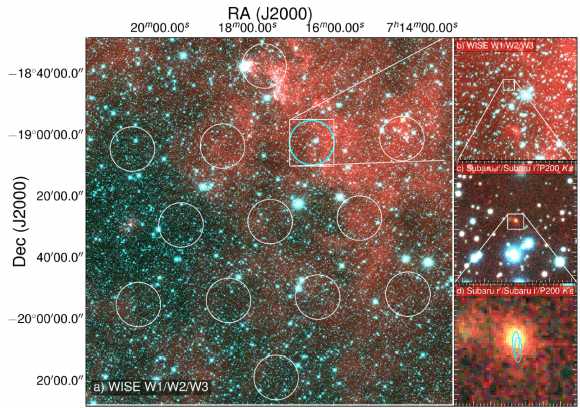 In the end, these and other discoveries by the SKA could have far-reaching consequences. Knowing the distribution of matter in the universe, and improving our understanding of dark matter (and perhaps even dark energy) could go a long way towards developing a Theory Of Everything (TOE). And knowing how all the fundamental forces of our universe interact will go a long way to finally knowing with certainty how it came to be. These are exciting time indeed. With every step, we are peeling back the layers of our universe! Further Reading: CSIRO, SKA Organization, Nature.